For the first time since he&apos;s been coming to Pac-12 media day, Utah coach Kyle Whittingham can look every other coach eye-to-eye and tell himself he&apos;s beaten all of them. In a Pac-12 Networks interview, Whittingham said he thought beating Oregon, Arizona State and Washington last year helped the Utes get over "some psychological humps. Yet, a big one remains. "We haven&apos;t accomplished anything yet  we haven&apos;t won a championship," he said. "That&apos;s what we&apos;re here to do this year, win a championship." Whittingham said he didn&apos;t think much about the preseason media poll, which slotted the Utes to finish third this year in the Pac-12 South. It&apos;s the second-highest the Utes have landed on the poll, being picked second in 2012. Coming off a 10-3 season, the program&apos;s best ever in the Pac-12, Whittingham said being picked third could be taken as "a sign of respect." But he isn&apos;t too invested in it. "I think being under the radar is more our M.O.," he said. "It doesn&apos;t really matter what people think going in. There&apos;s no surprise what is considered Utah&apos;s strength: line play on both sides of the ball. Said Whittingham: "We&apos;re expecting to be as good as there is in the conference, if not the best on both offense and defense." The Utes return four starting linemen on offense, including all-conference tackle J.J. Dielman who is in Hollywood for media days. On defense, the Utes bring back four starters (although Stevie Tu&apos;ikolovatu transferred to USC last month). Utah&apos;s biggest barrier to success is what it&apos;s always been in the Pac-12 era: the notorious "throw game," which finished second-to-last in the league last year. "We gotta be able to throw the football more effectively," Whittingham said. "That&apos;s what kept us from being able to win a championship last year, was our inability to throw the football efficiently." Whittingham said he expects the receivers group to be stronger, especially if it can field a healthy Tim Patrick, who missed all of last year recovering from an injury suffered in 2014. Dielman said he thinks any of Utah&apos;s three quarterbacks competing to start have "special abilities when it comes to throwing the football." In turn, it should lead to more offensive balance. "I think the program has really relied on its run game," he said. "I think we&apos;ll see a pretty even amount of both which will help us out in winning games." What&apos;s the biggest change from the start of the Pac-12 era to now for the Utah football team? Nickelback Justin Thomas and Dielman reminisced briefly over when they entered the program in 2012, and were working out of trailers as the Utah football facility was being constructed. "I thought that was how college football was," Dielman said. "Then we moved into the facility, which was like moving into the Taj Mahal." 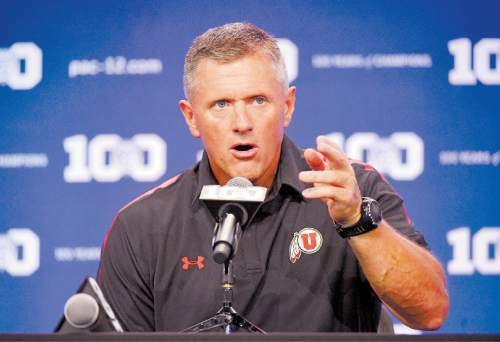 Kyle Whittingham&apos;s workouts are the stuff of urban legend, with hours logged on the stairmaster and pull-up bar. Pac-12 Networks host Mike Yam asked Whittingham if he worked out before his media day interviews or was planning on it after. Whittingham said before. "You&apos;ve got to get that workout in," he said. The panel then joked about the possibility that Yam might work out with Whittingham, prompting Yam to say he thought Whittingham was the most fit coach in the conference. "I know you could still play if you wanted to," Yam said. Quipped Whittingham, former linebacker: "I&apos;ve got about three snaps in me."